Every now and then I send off 3 to 4 gerbers to my friends at dirtypcbs.com. I really like them as they are really cheap (am I Dutch or what?) 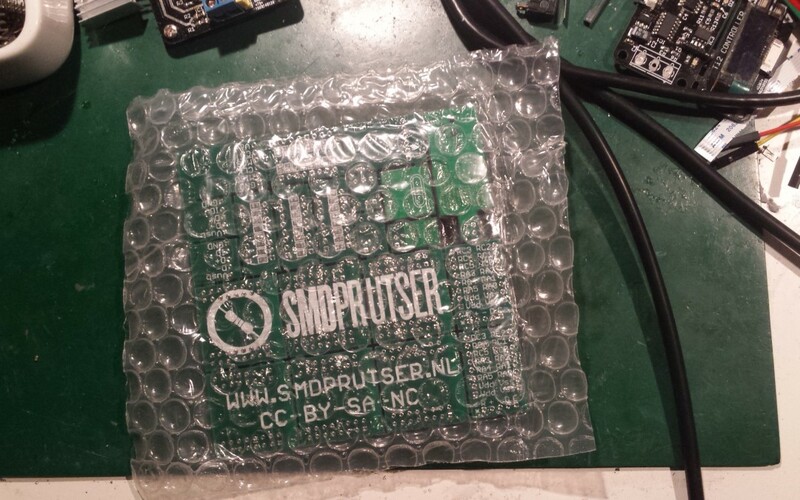 and they provide reasonable PCB’s. I don’t like to wait about 3 to 4 weeks for them to arrive so I use their DHL 3-5 days shipping option. That is relative expensive (about 25 USD), but PCBs don’t weight that much. Adding a couple more designs won’t add up too much to the shipping cost. C64 RAM/ROM cartridge with integrated SD2IEC. (Hopefully) Final design of breakable SMD protoboards. Can’t tell much about the PCB’s yet as I first started to solder the C64 RAM/ROM cartridge. As always the PCBs look very promising and wellmade but I tend to be cutting some corners. As a result there are tons of stupid mistakes and a board usually takes a revision or two to become usable 🙂 I’ll will write a post about that in the near feature and how to circumvent that. 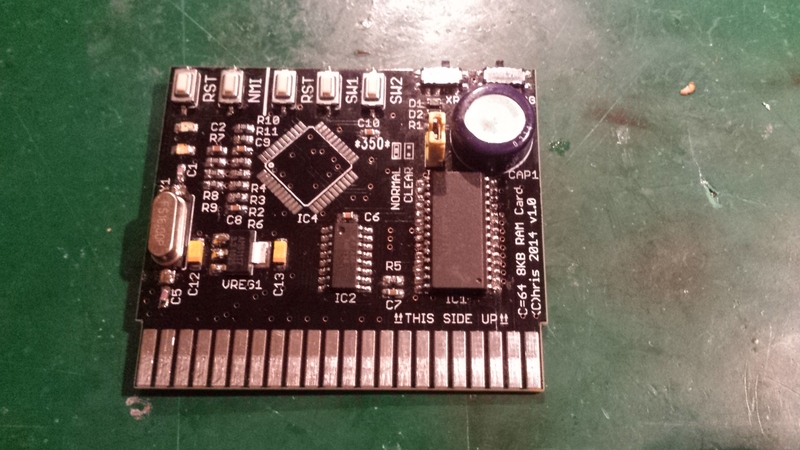 Here is a sneak preview of the C64 cart, which has a 6264 SRAM chip and a Atmel 644 (or 1284). 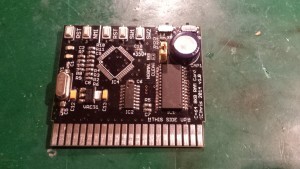 The SRAM can be programmed by the C64 and with the flip of a switch (actually 2) it becomes a standard 8K ROM cart. The Atmel part emulates a IEC floppy drive. I didn’t have the Atmel part yet at hand, but i soldered all the other components. I will do an update if the SD2IEC part is ready, for now the SRAM and the ‘cartridge’ emulation seems to work at first glance. From an old friend I got a vintage SX64 some time ago and decided it needed an upgrade with Jiffydos and SD2IEC. I like to keep the SX64 as original as possible. 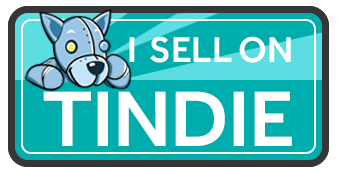 However I also like the silver thumbleswitches to choose the Kernal or cart. First I need to replace the kernal of the C64 and the 1541 part. Both are 23C64A EPROMs without a window. 23C64A EPROMS are hard to find nowadays so I made an adapter to a more common EPROM (as common as it get in these flash days). It can take a 27C64, 27C128, 27C256 or 27C512 EPROM. It has the upper address lines broken out to select the ROM bank. When trying out the protoboard and taking pictures of it I noticed I made some errors and got some of footprints wrong. I replaced all the resistors/capacitors/LEDs with an 0805 footprint (accepts 0603 too). Also I used a hard to hand solder micro usb connector so I ditched that in favor of a mini USB. I tried to fix some other stupid mistakes on the PSU and uSD breakout. I always wanted to built my own powersupply, but to test it you need a dummy load. As a dummy load is easier to start with I started with that 🙂 I got inspired with the re:load and added my own sauce.